“A Christmas Tapestry”, the 40th Annual Christmas Dinner and Concert. 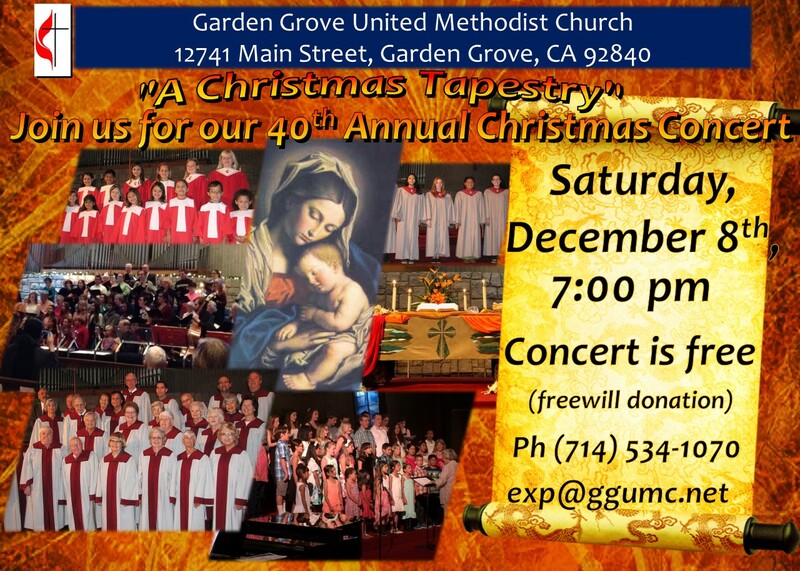 Saturday, December 8th – “A Christmas Tapestry” the Garden Grove United Methodist Church Music Ministry’s 40th Annual Christmas Dinner and Concert. Doors open 5:30 p.m., Dinner 6:00 p.m. Adults $16, Children $8. Reservations for dinner are required. Reservation deadline is Tuesday, December 4th, call 714-534-1070. If you are unable to attend the dinner, you may still attend the Concert for a freewill donation at 7:00 p.m. in the Sanctuary.